Erin Hanson’s dramatic oil paintings are inspired by rock climbing the Red Rock Canyon and the southern California desert. She uses her brush to create impressionist interpretations of the landscape of Utah, Nevada, Arizona, and California. 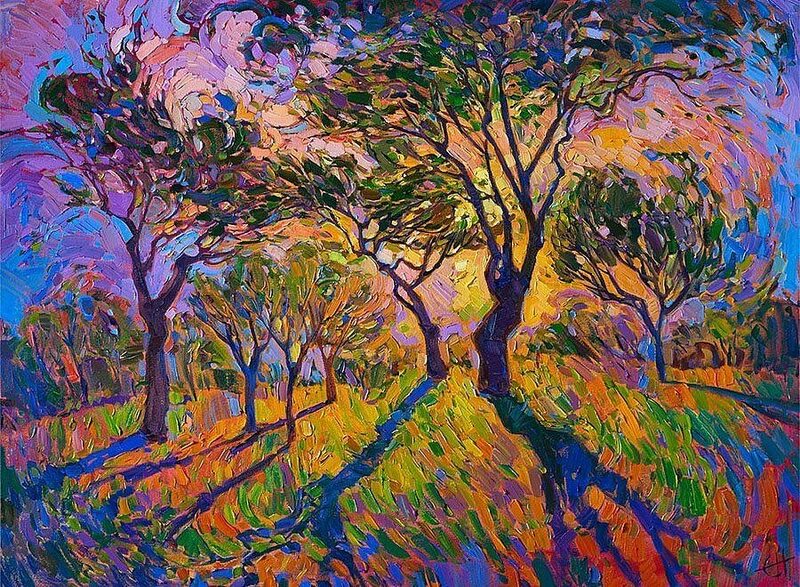 Hanson has merged influences from various styles to create a unique style of her own, bringing together aspects of classic impressionism with modern expressionism, topped off with a dash of “plein-air” style. The image above depicts a grove of trees basked in the light of the setting sun. A vibrant blend of colors, both complementary to and contrasting with each other, adds a sense of festivity to the painting but also contributes to an air of chaos in the landscape. The swirling array of color melds together into the sky as though to form a vortex, drawing the earth closer and eventually consuming it to form one entity. The spindly branches of the trees, strangely distorted, stretch upwards and reach towards the sky, consummating the union between the land and the heavens. The familiar and yet simultaneously alien form of the trees leads the viewer to question whether what they are seeing is a dream, or perhaps a hallucination. The fiery oranges and yellows occupying the center of the painting change and eventually fade into deep violets and blues at the edge of the sky, signaling the descent of night and tingeing the otherwise cheerful atmosphere with a splash of somberness. The oozing pools of color at the upper corners of the painting almost resemble the contents of an oil spill while the careless flecks of paint constituting the earth form the image of a wind rustling the blades of grass as it passes over the earth. The painting evokes a confused jumble of emotions in its viewers: is it the anticipation for the festivity, the intoxication in the chaos, or the apprehension of the encroaching darkness that dominates? The artist’s work may be inspired by a real landscape, but this scene exists nowhere in reality; like the emotions it evokes, it is a motley mixture of elements blended together to form something surreal. The long shadows cast by the trees, which extend out of the painting, seem to be an invitation for the viewer to explore further and enter the dreamscape. The temptation to lose oneself in the painting, to dance wildly and drunkenly through the beckoning trees, is ever-present. Still, an edge of danger is present: while the landscape seems to stretch on infinitely, it calls for the viewer to pursue the sun at its end. Who then is to say whether the viewer will become the hero of his own story, wandering realms previously unknown to mankind, or merely another cipher lost in the all-consuming heat of the sun, scorched as Icarus once was and plunging into the depths of the darkness? Which path does this painting take you down? The painting evokes a confused jumble of emotions in its viewers: is it the anticipation for the festivity, the intoxication in the chaos, or the apprehension of the encroaching darkness that dominates? Can I be placed o. Your email list for articles and art. Thank you. Love the colorfulness of the painting and the reflections of the trees; it gives me more of a positive vibe and anticipation for the festivity.